The boy needed a nudge from his mother. “Tell everybody where Daddy is,” Kendall Phills instructed her 3-year-old son. “Daddy is in heaven with the angels,” Bobby Phills III told several hundred mourners at Charlotte’s Central Church of God before returning to the crowd and embracing his year-old sister, Kerstie. On that day more than 15 years ago, the NBA grieved over the death of Bobby Phills, who began his career on a 10-day contract and rose so high that Michael Jordan once named him among the best defenders he’d ever faced. Those close to Phills never seem to run out of stories about his selflessness. There was the time he jumped out of his car at an intersection to help a motorcyclist who was engulfed in flames after crashing into a nearby truck. Phills would sign autographs until his hand hurt. He ran basketball clinics and contributed to Charlotte-area charities. If you had five minutes to spare for Phills, he had 10 minutes for you. 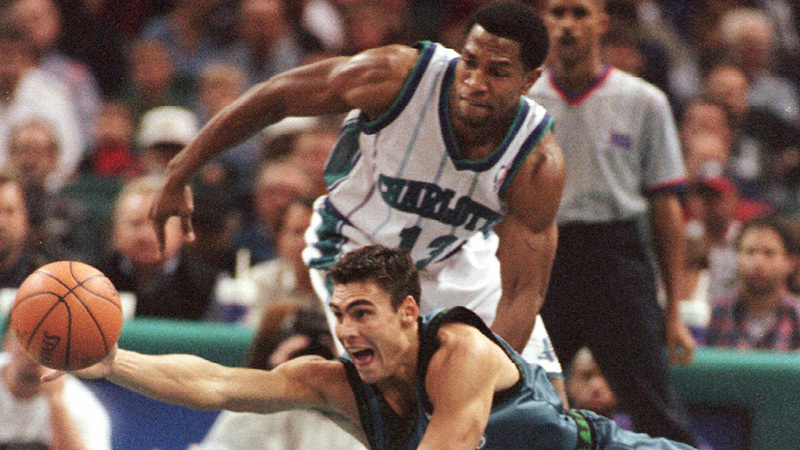 On the morning of January 12, 2000, the Hornets had just finished a morning shootaround. Phills spoke with his coach, Paul Silas, before sliding behind the wheel of his 1997 Porsche 993 Cabriolet. The black car carried a vanity plate that read “SLAM’N.” “That was his dream car,” recalled Phills’s younger brother Dwayne. “That was the one car he had always wanted.” Phills encountered teammate David Wesley, also driving a Porsche, less than a mile from the Charlotte Coliseum. The two hit speeds that authorities later estimated topped 100 mph, traveling east on West Tyvola Road. Phills lost control of his car on a hilly bend. The vehicle skidded several hundred feet and into oncoming traffic, where it collided head-on with another car. Phills died instantly. That moment — that mistake — ended Phills’s life at 30 years old. It also altered the lives of many others still affected by the tragedy years later. Jobe told Phills he wouldn’t check to make sure Phills took his daily shots, but the coach would be able to tell if Phills put in the work by the time practice resumed in the fall. Before long, Jobe noticed slips of paper arriving under his office door — Phills had begun charting his daily makes and misses. Once, Jobe walked into the gym to find Phills’s younger brother rebounding for him. Jobe told Phills to shoot alone. Phills agreed, and a couple weeks later, he approached the coach. “I know why you wanted me to do this by myself and you didn’t want anyone throwing the ball back to me,” Phills said. “You figured it out?” Jobe asked. Phills became a rotation player, and as a senior he led the country with an average of 4.4 made 3-pointers per game. That season, he scored 52 points against Alcorn State, hitting 10 3s in a game attended by several NBA scouts. Jobe had little doubt that once Phills earned an opportunity in the NBA, he would thrive. The Milwaukee Bucks drafted Phills in the second round of the 1991 draft, but they cut him before the season. Phills played in the Continental Basketball Association before joining the Cleveland Cavaliers in 1992. Jobe lost his love for coaching after Phills died. “Things changed,” Jobe said. “Young people changed. Kids started acting different.” He is a longtime friend of Indiana Pacers consultant and former New York Knicks general manager Donnie Walsh. When the Knicks hired Walsh in 2008, Jobe came aboard as a scout, and he remains part of the Knicks organization. “If it hadn’t been for Donnie, I wouldn’t be doing what I’m doing now,” Jobe said. “It helped to relieve my depression. That thing with Bobby Phills, I’m telling you, it almost made me lose my faith. He’s the last person something like that should happen to. That boy he was speeding with, I don’t know what I would have done if I would have seen him. I don’t even know his name. I don’t know his face. I don’t know anything about him. I blamed him. When something like that happens, you blame everybody. I blamed his parents. I blamed the Charlotte Hornets. I blamed everybody. It got so bad, I blamed God. It just don’t make no sense. Paul Silas had nearly given up the dream of securing another NBA head coaching gig. More than 15 years had passed since his last go-round as head coach, with the dysfunctional San Diego Clippers in 1983. Silas joined Charlotte in 1997 as an assistant under Dave Cowens. When a salary dispute led to Cowens’s sudden resignation in 1999, Silas inherited the top job. The Hornets were 15 games into the lockout-shortened 1999 season, with a 4-11 record, when Silas took over. The new coach was close with Phills, whom Charlotte had signed to a seven-year, $33 million contract in 1997. As an assistant, Silas had often run Phills through drills during training sessions. The two lived close to one another, and after games, Phills’s wife, Kendall, often drove Silas’s wife, Carolyn, home from the Charlotte Coliseum. After Silas was named interim coach, Phills asked him, “Coach, you want to keep this job?” Silas answered yes, and Phills told him, “OK, you’re going to have it.” Phills encouraged his teammates to dig in and finish the 50-game season strong, and Charlotte went 22-13 under Silas that year, good enough for the Hornets to name him the full-time head coach. Phills left Silas’s office. A few minutes later, according to Silas, the coach received a call from David Wesley. “Coach,” Wesley said. “Bobby Phills — we got in an accident.” Silas wasn’t alarmed at first. He got into a car with the Hornets coaching staff and made the short drive to Tyvola. Silas looked at the wreck and into Phills’s car. It didn’t look like Phills was alive. Silas, known as one of the greatest enforcers and all-around tough guys in NBA history, broke down in tears. Someone reminded him they still weren’t certain that Phills hadn’t survived; he could just be unconscious. This gave Silas some hope, and he approached the car. He saw Phills’s mouth hanging open, and eyes closed. Eventually, a police officer covered Phills’s face. “Bobby, he was a fast driver,” Paul Silas recalled. “One time after a game, we were driving home. I had gone out before him, and he was passing me, and he was going close to 100 miles an hour.” Silas approached Phills at practice the next day. “Bobby, you can’t do that,” he told him. “You’ve got two beautiful kids. You’ve got a great wife. You can’t drive that fast.” Phills, Silas said, told him it was not a big deal. T he day is going pretty decently, Robert Woolard Jr. thought. Woolard, an insurance adjuster and appraiser and native North Carolinian, had just finished inspecting one vehicle and was headed uptown to check out another. He had only recently purchased the Oldsmobile Cutlass he was driving when he turned onto Tyvola. After learning that his wife was pregnant, he’d bought the new car in preparation for the arrival of their child. Everything hurt. Dazed, Woolard gazed into the Porsche. The other driver was slumped, unmoving, blood trickling from his nose. Woolard was in too much pain to move. A minute passed. Then a few more. Woolard laid his head down before hearing a voice. At one point, Woolard looked out his window and noticed only long legs. These must be some tall guys, he thought. He heard the name “Phills.” A jolt of recognition hit Woolard: Oh my gosh. He’s a Hornets player. Medical personnel removed Woolard from the car and sent him to Presbyterian Hospital. He nearly died from a flattened aorta suffered during the crash, and endured other injuries like a broken hand, a torn knee ligament, and numerous cuts and bruises. He was lucky to have survived. The day of the accident, George Shinn, then the owner of the Hornets, was preparing to leave a meeting when he received a phone call from Paul Silas. “Bobby is gone,” Silas said. Maybe he didn’t say that, Shinn thought, trying to rationalize what he’d heard. Even as he made the short trek to the scene, Shinn kept thinking, Maybe I heard him wrong. Hugh Wallace considered Phills’s competitiveness one of the player’s greatest strengths. Phills had arrived at Southern’s laboratory high school after his father became dean of the university’s school of agriculture and consumer sciences. Wallace taught and coached basketball at the high school, and Kendall had also been one of his students. “She had this fantastic crush on Bobby,” Wallace recalled. Wallace mandated that all of his players learn to play in the post. Phills spent the bulk of his high school career in the paint, where he was often outsized but seldom outmuscled. He averaged 26 points and 13 rebounds his senior year and helped the team to a state championship. Wallace believed Phills had the talent to play in the NBA, but only if his career broke the right way. He advised Phills to pursue professional basketball for a couple of years, and if it didn’t work out, to return to school. 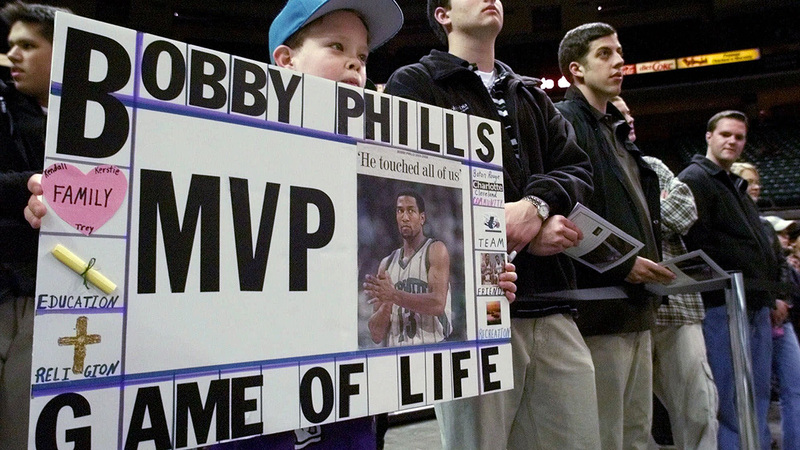 No matter who you were on the team or within the organization, Bobby Phills looked out for you. When he died, Brad Miller and Baron Davis were both beginning their NBA careers, but in opposite ways. Miller went undrafted out of Purdue and played briefly in Italy before latching on with Charlotte. The Hornets selected Davis with the third pick in the 1999 draft. He was the franchise’s future — a brash, bowling-ball point guard who expected immediate NBA stardom. “Basically, as soon as I got [to summer league], [Phills] threw me his practice stuff,” Davis recalled. “He was like, ‘All right, start carrying. Start working.’” Phills made the rookies pay their dues, but along with tough love he dispersed nuggets of wisdom that would help them blossom into NBA starters. The advice meant a lot to Miller, who looked up to Phills and Wesley, players who hadn’t been first-round darlings but who had managed to thrive in the league. “[They discussed a] lot of little things that when you’re a youngster coming into the league, you don’t think about,” Miller said. Miller, who often joined Phills and Wesley for pregame pancake meals, maintained the flapjack routine throughout the rest of his 14-year career. The day of the accident, Miller had returned to the Hornets practice facility after shootaround to lift weights. He heard the news about 10 minutes into his workout. Miller was unsure what to do. He had never experienced the death of someone close to him, someone who was young and vibrant and seemed destined for a long, happy life. “You hope no one would ever have to feel that,” Miller said. Davis was in his own car when the crash occurred. He trailed Phills and Wesley on Tyvola by less than a minute. He had stopped at a red light, turned left, and then approached the scene. He surveyed the wreckage, concluced that Phills had not survived, and walked over to Wesley, who was standing, speechless, with his hands on his head. “That memory always is there with me,” Davis said. Nell Redmond/AP Photo Kendall Phills at a 2001 memorial service for her husband. Kendall Phills went running with a friend the morning Bobby died. After the dawn jog, she came home and took their son to school, where she remained for an hour or so, chatting with other parents. By the time she returned home, Bobby had left for shootaround. She called him a short time later, wondering if she should make pancakes at home or if she should meet him out. Bobby did not answer, which was strange for him. Then David Wesley’s fiancée, Shannon, called. There had been an accident. Kendall needed to get to Tyvola. She got in her car. From nowhere, a voice popped into her head: Bobby is dead. She talked back to the voice. “No, that can’t be true.” She called Wesley. He answered, crying. She drove closer and saw the police and emergency personnel. She pulled in behind George Shinn’s car. The owner is out here, she said to herself. This must be bad. She exited her car to see Bobby’s teammates Elden Campbell and Anthony Mason, both in tears. 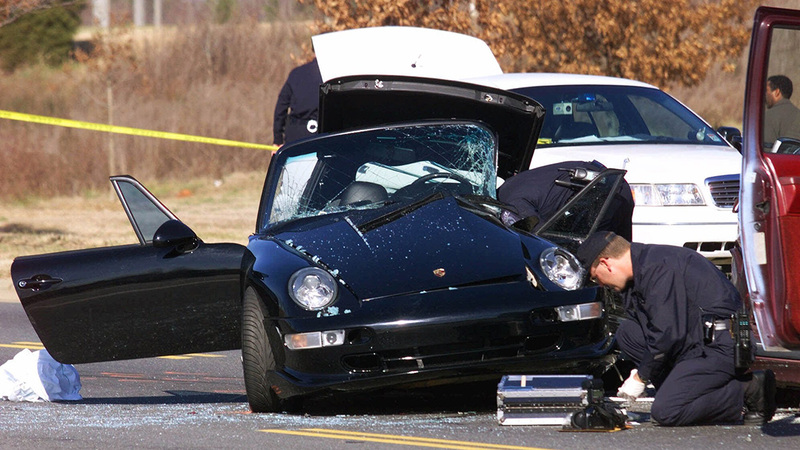 She saw paramedics on the scene and feared the worst as she turned to look at her husband’s Porsche. A body covered by a white sheet rested inside. Some of the coaches tried to restrain her. She broke free. “Took the sheet off his body,” Kendall said. “He was in his car, lifeless.” She prayed for him, told him that she loved him, and promised to take care of their children. 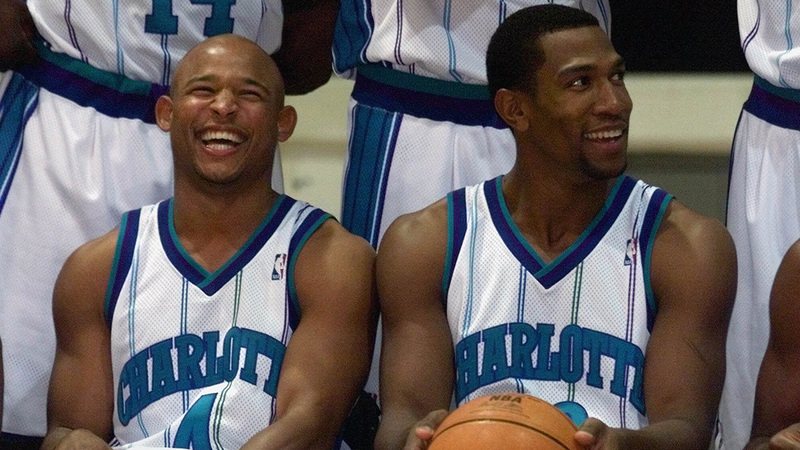 Bobby Phills Sr. recalled receiving a call from Dwayne. “What you doing?” Dwayne asked. “You sitting down?” Phills Sr. knew something had to be wrong. “I’ve got some bad news,” Dwayne told his father. “Bobby was in an accident, and he didn’t make it.” Phills Sr. doesn’t remember yelling, but people later said they’d heard him scream from his office. The Hornets returned to the court January 15, three days after Phills’s death, with a loss to the Knicks in New York. “Look, I understand the way things are with you guys,” Silas told his shellshocked team. “But Bobby Phills would want us to play hard, and he would want us to win.” Wesley started against the Knicks that night and missed nine of 11 shots. Afterward, the team chartered to Charlotte before flying to Baton Rouge for Phills’s funeral. The next month, Wesley was charged with two misdemeanors: speed competition and reckless driving. The Charlotte Observer reported that both Phills and Wesley had previous speed violations. Wesley had twice been charged with speeding in Mecklenburg County, which includes Charlotte. At the time of Phills’s accident, Wesley was driving on a suspended license, after he had failed to comply with the terms of a citation he had received several months earlier in Alabama. That July, Wesley testified in the non-jury trial to decide the criminal charges against him. 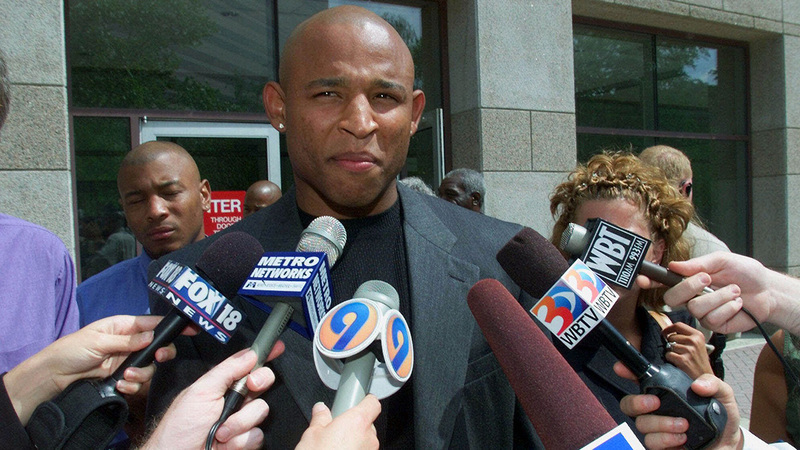 “Were you racing Bobby Phills that day?” his attorney asked. “Absolutely not,” Wesley responded. He was convicted of reckless driving and sentenced to community service, but a judge decided that enough reasonable doubt existed to acquit him of the racing charge. On the first anniversary of the accident, Wesley buried a deep 3-pointer with 3.5 seconds remaining to lift Charlotte to an 86-85 win over the Bulls. Wesley remained with the franchise when the Hornets moved from Charlotte to New Orleans in 2002. He spent the final years of his career with the Houston Rockets and Cleveland Cavaliers before retiring in 2007, and he now works as a color analyst for the Pelicans. Trey, a 6-foot-1 guard, recently finished his high school career at Charlotte Christian, the same school that produced Steph and Seth Curry. “Trey’s a stat stuffer,” said coach Shonn Brown. “He gets rebounds. He gets deflections. He gets steals. He has assists.” This season, as a senior, Trey led Charlotte Christian to a 20-9 record, the highlight of which was a breathtaking game winner Trey scored against Charlotte Country Day. The Hornets brought the franchise’s history with the team to Phills’s native Louisiana, where he never played professionally. 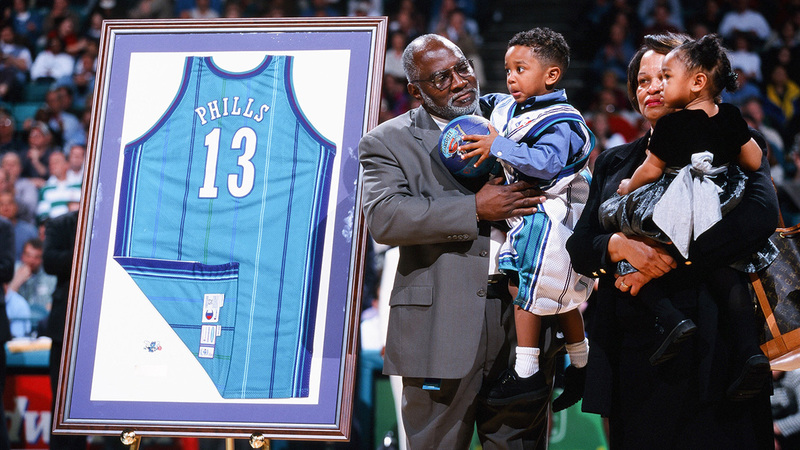 The Charlotte Hornets had retired Phills’s jersey shortly after his death. In New Orleans, the organization raised his no. 13 in its practice facility, but not in the Smoothie King Center. Phills’s former teammates Todd Fuller, Chucky Brown, and David Wesley attended the ceremony. Wesley looked at Trey that night and almost seemed surprised that he had to look up to meet his friend’s son’s gaze. Kendall walked onto the court, accompanied by Trey, Kerstie, and Brittany Dixon (Bobby’s daughter from a different relationship). Bobby Phills Sr., Mary Phills, and Dwayne Phills also attended. The fans offered the family an extended ovation. The emotion hung in Kendall Phills’s voice as she addressed the crowd. She thanked the fans for the phone calls and well-wishes. 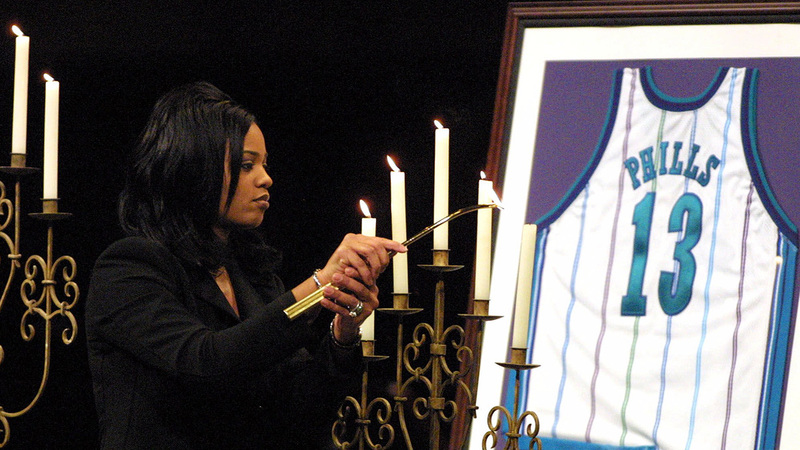 She was grateful for the Hornets organization’s support. Bobby Phills had always wanted to be an All-Star, she said. To Kendall, the legacy he left behind in Charlotte was a higher achievement, one that represented Bobby’s contributions to the community as well as on the court. From the darkened arena, one active Hornets player had returned early from halftime to watch the ceremony. Gerald Henderson was drafted by Charlotte in 2009, and over his five NBA seasons, he’d grown close to the Phills family. Trey looked up to Henderson; he says he has observed aspects of the swingman’s game that remind him of his father’s. He watched Kendall experience such pride and sorrow at center court, and when she’d finished speaking, Henderson walked out to Kendall and embraced her. Kendall finished her speech. She walked off the court with a piece of herself still forever gone, but knowing that her husband had not been forgotten. No. 13 was where it belonged.